Iran’s navy possess three Kilo-class diesel-electric submarines. A new class of 3,200 ton attack submarines will soon be assembled in local shipyards for the Islamic Republic’s miniscule navy. But little else was revealed by Iranian state media during a maritime and naval exhibition in Kish this week. The tonnage of the would-be submarines are suspect as they scale twice as heavy as current-generation diesel-electric models in Europe and East Asia. 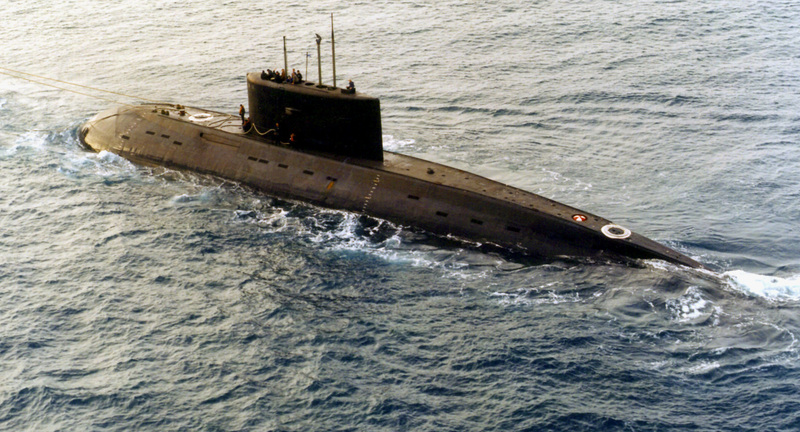 Their alleged dimensions of “87 meters in length and 10 meters in diameter” measure beyond the size of the Soviet era Kilo-class submarines operated by the Iranian navy. In recent weeks, however, there has been a renewed publicity blitz for Iran’s sea power with official propaganda hailing the arrival of new midget submarines and even an anti-submarine destroyer–all made inside the country. 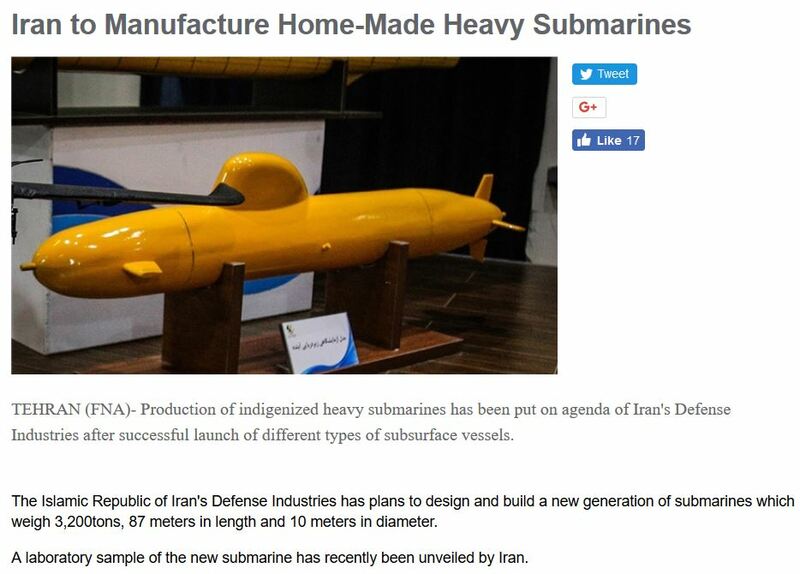 There’s no evidence yet that a “heavy” Iranian diesel-electric submarine is under construction and the laughable photo of a yellow desktop model shared by state media is only useful as a conceptual reference. While there’s little current sanctions can do to prevent Iran from building submarines, the dismal track record of budget cuts and delays that have almost ruined Iranian efforts at building surface warships is a sobering reminder that straightforward naval projects can still turn out embarrassing and expensive. There are many instances when the Defense Industries Organization (DIO), an official department that oversees military-industrial production, squandered its resources on questionable projects. A glaring example is Iran’s lame boast of having a “domestic fighter jet” when it’s apparent the Kowsar is the US-made F-5F Tiger II with slight upgrades. Comical helicopters and vehicles have done their part to inspire contempt rather than grudging admiration for the DIO’s engineering prowess. Naval strength is another conundrum. On paper, Iran’s navy boasts several corvettes, nearly a hundred fast attack craft, and based on open source estimates at least 21 submarines–three of which are ex-Soviet Kilo-class subs. The reality, however, is less flattering. The Islamic Republic maintains two naval fleets, one belonging to the Revolutionary Guard whose makeup seems better suited for coastal defense and the “regular” navy. 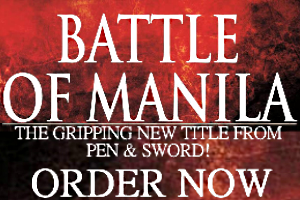 Both maintain their own marine contingents for amphibious warfare and separate aviation fleets. As if this weren’t confusing enough, their surface vessels combined totals two hundred small ships with varying capabilities. How a new class of diesel-electric submarines are supposed to improve this arrangement is befuddling. Yet the GCC and Iran’s other rivals can’t afford to dismiss this aspiration for attack submarines. Even if the DIO are unable to import the needed engines and other subsystems (leaving it to reverse engineer foreign products) its partners do manufacture anti-ship missiles, cruise missiles, underwater mines, and torpedoes for submarines. It doesn’t help that a diesel-electric submarine is ideal for exploiting choke points in and around the Arabian Peninsula and regional navies are simply not equipped to defeat these. For perspective, it’s useful to compare what is known about this Iranian “heavy” submarine and a close analog. The Chinese Yuan-class that’s available for export under the designation S-20 is a diesel-electric model with a displacement exceeding 3,000 tons and a length of 74 meters; what Iran’s DIO is claimed to be working on is much larger, in fact. The Chinese Yuans were designed for prowling shallow seas armed with anti-ship missiles and torpedoes. Does this mean the Iranian navy are betting on the same? How many can they afford to operate, anyway?